Join us as we welcome "Art With Impact," a North American charity that promotes mental wellness by creating space for young people to learn and connect through art and media. We will be screening three short films created by emerging and social justice filmmakers on the subject of mental health. 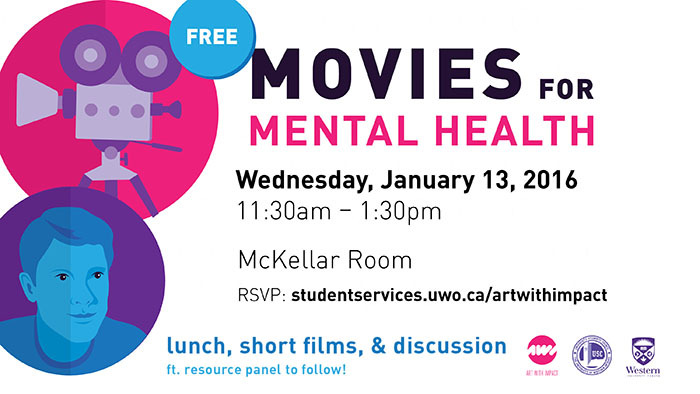 Each short film screening will follow with a discussion facilitated by Art With Impact in order to break down stereotypes and stigmas surrounding mental illness. Following the screening, a panel will take place consisting of lived experience speakers and campus and community resources, including a panel Q&A. Lunch and drinks will be provided. Registration is FREE.